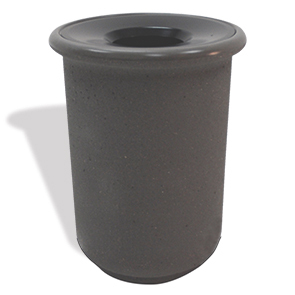 Senora Series concrete waste containers integrate modern elegance with a superior performance. Upgrade trash management and site design with the sturdy construction of this 26 gallon waste container. A slightly elevated recessed base and rounded lines allows this receptacle to have a more distinguished, attractive shape and presence. Modern aluminum funnel lid tops the container and encourages responsible litter and waste disposal. The concave funnel style discourages placement of litter on top of the lid and prevents inside contents from escaping, allowing the natural beauty of the landscape space to show clean through. Concrete receptacle needs to be placed on a solid flat footing that will not shift, flex or move. Constructed with extremely durable precast concrete reinforced with steel rebar, this waste container has incredible strength and resiliency even in the most demanding of conditions. Achieve an architectural balance with the available standard and premium ASTM compliant precast concrete finishes.